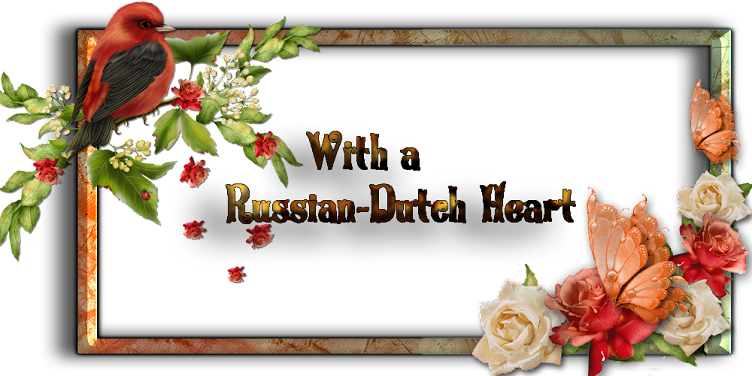 With a Russian/Dutch heart: Busy and messy day today! Busy and messy day today! Well, I had some planning yesterday and some of it is even accomplished. I am not completly satisfied with myself, because I didn;t do all I wanted, but most of it is done. I went out yesterday late morning for a little food shopping and gosh, it was rather cold. Must say it was refreshing, but I am longing to that nice Spring weather LOL. In our neighbourhood we have a big Polish supermarket and every now and then I take a look there, and I was there yesterday too, bought us some ham and other sorts of meat for our sandwiches. They have wonderful hams and much lower in price than in our "Dutch"supermarket and taste is really yummie! Only the wrapping of it isn't as sophisticated (but you also pay for that and you almost always remove it right away). They have soooo much stuff there, only a pity I cannot understand all that is written on the products, although I can understand the general meaning of it. Well, if I need to know more specific I ask someone in the shop and most of the times they are very kind and willing to translate, so I guess i will visit them more often. Yesterday it was the holiday of the Three Kings, visiting little Jesus in the manger, so I've put the 3 statues around the crib and had the lights on all day. Now today jan and I will remove all Christmasdecoration, so most of the day our room will be messy, but it takes less time to remove all than putting all up! I just want to put all back into the boxes a bit organized( as I did last year), because it helps really when you need it all again next Christmas. I have one box for all the baubles, and another for the lights(the strings rolled up and held in good order with a string) together with all garlands( also rolled up as much as possible), and another box for all the various decorations, oh and one little box for all the statues of the manger. It takes perhaps a bit more time, but it saves time too. After all will be gone again, I am sure the room will need a proper vacuum cleaning and dusting LOL. I mostly will miss the little Christmaslights in the evening, they make the room so cosy! But i still have one present under the tree, that I can open tomorrow, because then it is my birthday. Not really an occasion to celebrate in an enormous way, LOL, cause we only get older and older, and i will reach the 62! Aweful, isn;t it? Can you remember the days when you were looking forward to your birthday and was soooo anxious to reach first 12 years of age, then 16, then 18 (oh my, that really was a kind of border to cross), and even 21 was special. After that it was just a nice day, but after 40, oh my, how quickly the years went by, hahahaha. So I will not spend too much time on this post, want to do some small things before starting the job. 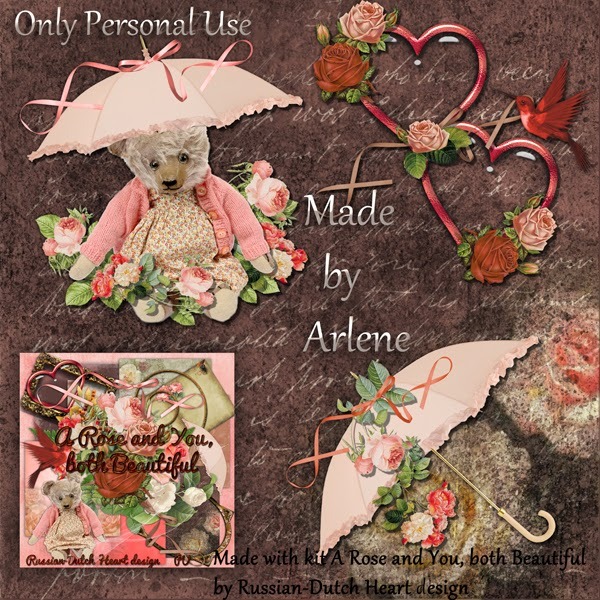 Today there is a wonderful add-on from Arlene on the last kit. 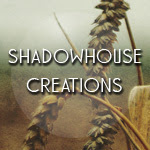 Perhaps you can visit her blog (see for links in the side bard under the header Bloglayout) to wish her a happy New Year? Want to thank all of you for the lovely wishes I got in the comments and shoutbox, they are so appreciated and always bring a smile to my face! Good morning Kyra. I, too, went outside yesterday. Oh my, it was not only cold, but it was snowing too. I have to say though, that it was a bit refreshing to breathe in the fresh air. Wow, 62 yrs!!! I remember mine. It was a milestone because I was eligible for Social Security then. Of course, now I'm just older. I'll be taking down my tree today too. It's time to put the holidays behind us and move on with the new year. Can I be the first to wish you a most happy birthday for tomorrow. I hope you have a beautiful day. Now I must see about posting on my own blog. You have a super nice day, hugs, Edna B. Happy birthday, Kyra! My birthday is Dec. 29 so we are alike in having our birthdays around the holidays. I remember looking forward to my birthdays too, not like now when I have reached the old age of 61. I read you every day, but never comment. I will try to comment more this year. Adorable...here we've just finished Christmas and it is time to look forward to Valentine's day. Thanks Arlene for giving us a head start on it. Blessings! Hello and Happy Birthday Kyra, I hope you have a fantastic Birthday and the year ahead is good to you. 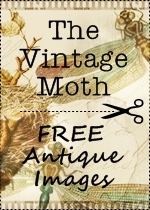 Thank you and Arlene for this lovely download. Hello my dear sweet friend! I wanted to stop in to wish you a most enjoyable birthday tomorrow! 62 is the age I filed for early retirement, but got placed on disability instead, but at 65 they had no choice but to let me retire! LOL...I did enjoy working the last 3 years from home though! I know what you mean about the time flying by....the older you get the faster it goes by...I will turn 68 in May and can remember that I thought I would never reach 50....ROFL! Just enjoy each and every day that passes! 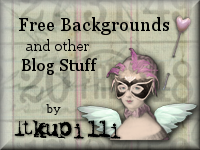 Meant to tell you I love the new backdrop for your page, it is quite lovely and yes romantic too! Thanks to you and Arlene for the lovely additions to the kit, she is so generous too! I adore this kit. Well, old man winter has finally found Texas...it was 14F this morning with a wind chill of 9F, needless to say, I am like a bear and have chosen to hibernate until it warms up some....LOL...at least no snow, no ice and no sleet, that is until tomorrow...or so they are predicting!